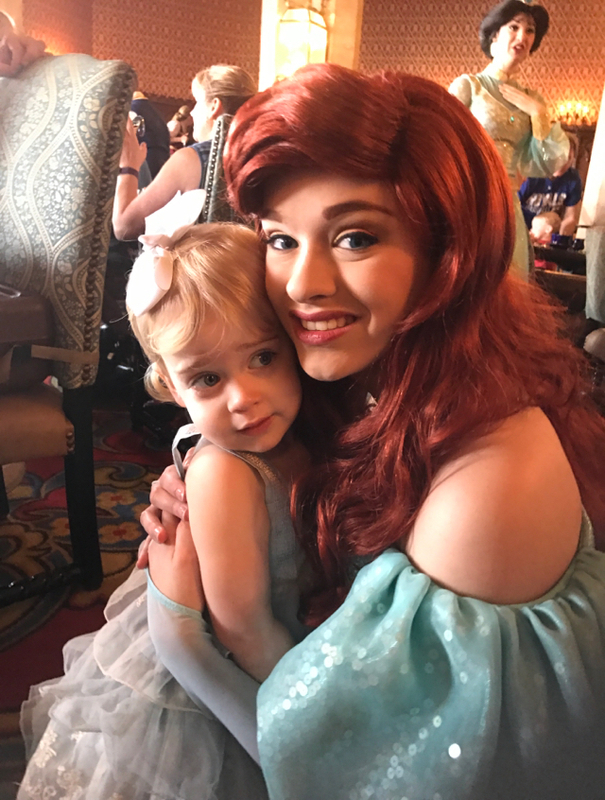 Our second day at Disney was jam packed with princesses. 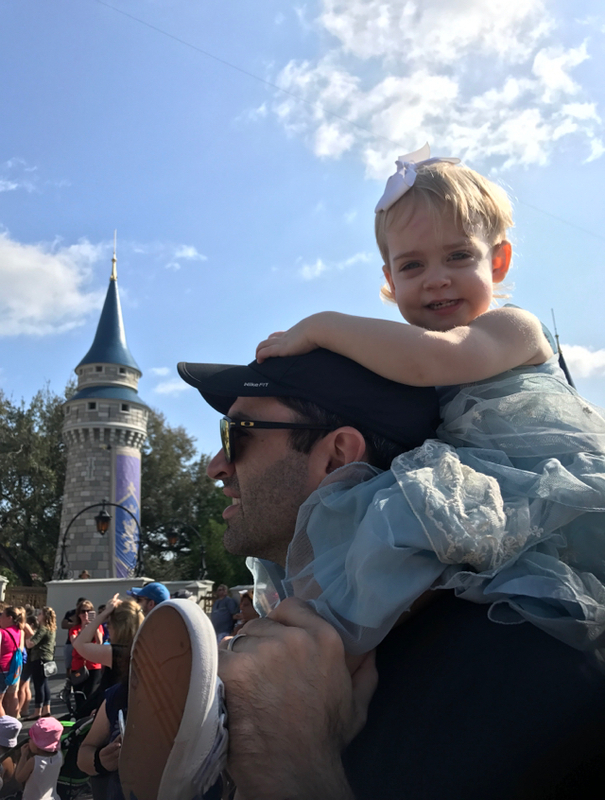 We spent Thursday at the magic kingdom, which turns out was a great plan. The crowd was small and the lines were short--it was perfect! We started the day with breakfast at Cinderella's Royal Table--aka breakfast with princesses in the castle. 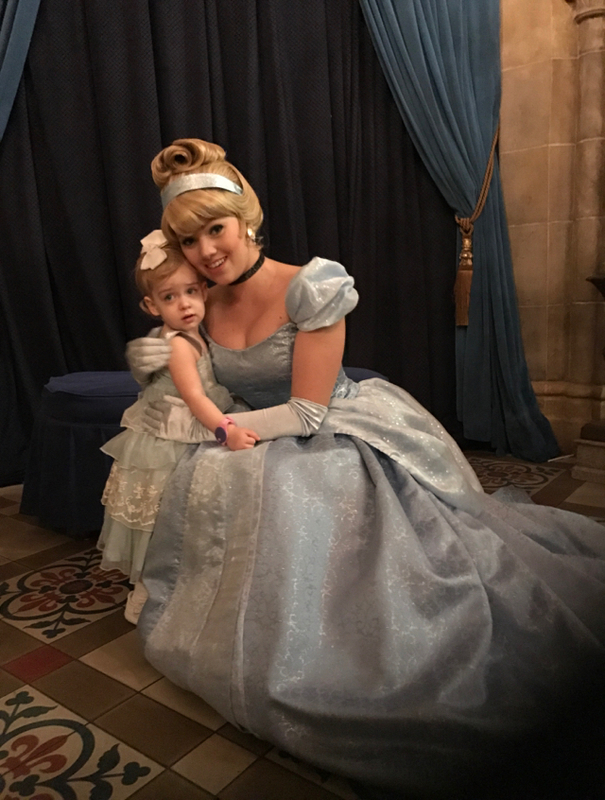 We started by meeting Cinderella--Charlotte was in awe! 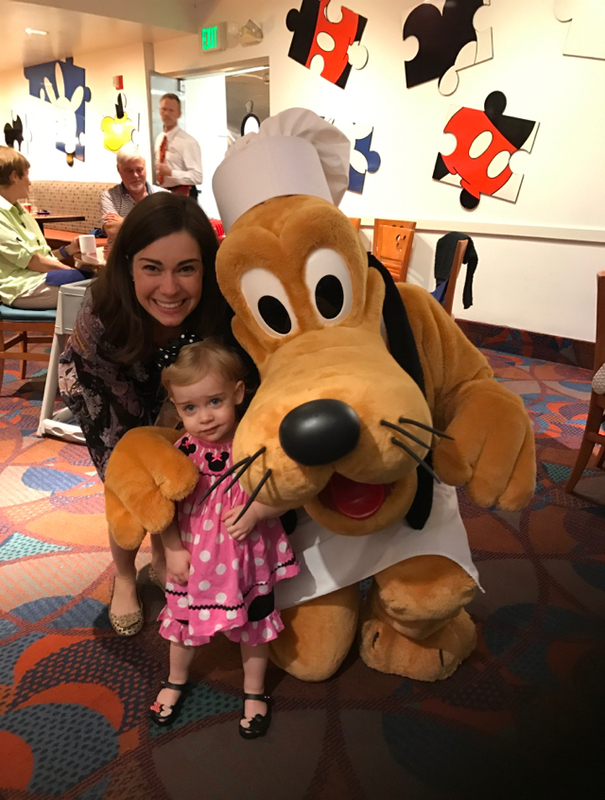 If you are contemplating a Disney trip with a little one, a character meal is where it's at! The food is good, you get to sit and eat gobs of food for as long as you like, and the characters come right to you--no lines! 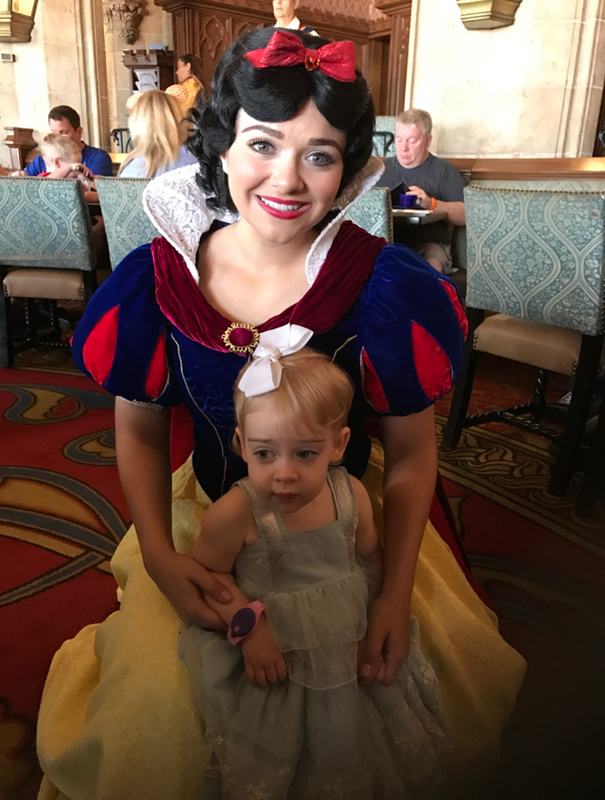 Charlotte wasn't super great about waiting her turn (which you have to do) but it was far easier to entertain her in a restaurant than in a line. Plus, you knock out several characters all at once! She was in heaven! 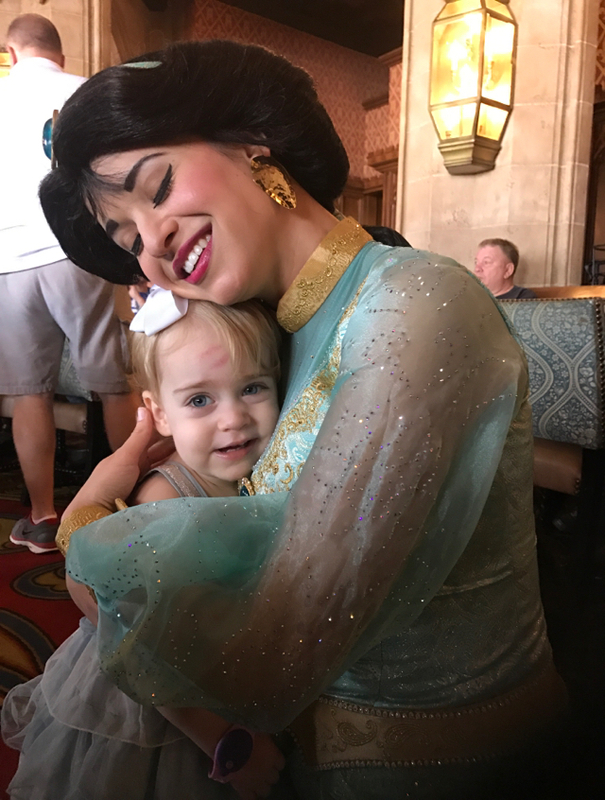 Her favorite was most definitely jasmine! Afterwards we caught a show outside of the castle--mickeys friendship faire. It was so sweet and again c loved seeing her favorite characters. Next it was off to ride some rides--we had fast passed some but the crowds were so short we really didn't even need them. 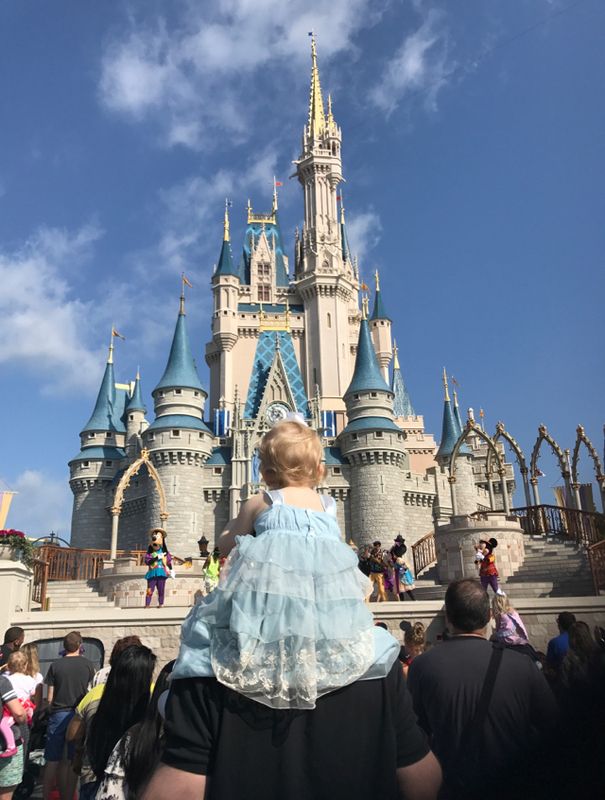 We used the extra time to see princesses that we didn't think we would get to see! 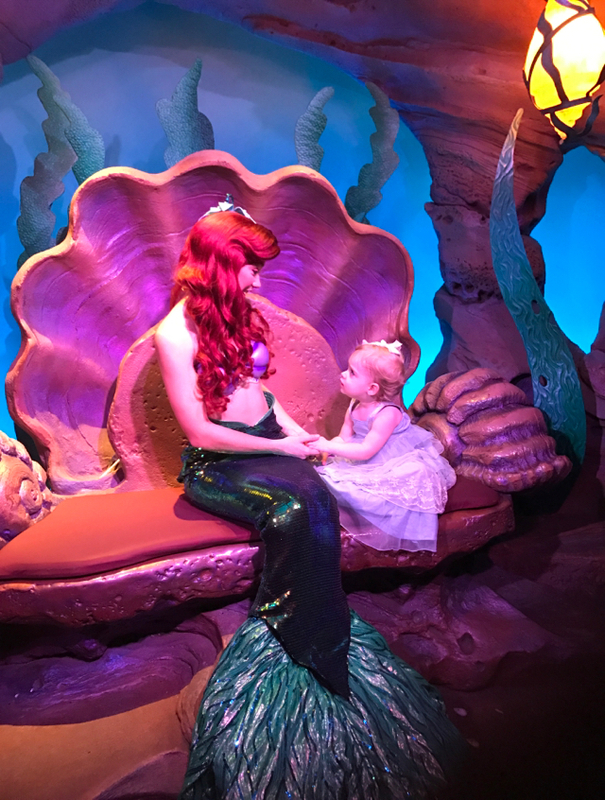 She was so excited to see Ariel with a tail before we rode the little mermaid ride! I've said it probably 1000 times, but I do not know where the time has gone and how my baby can be 2 years old. I felt every day of her first year, but this second year has been a blast! 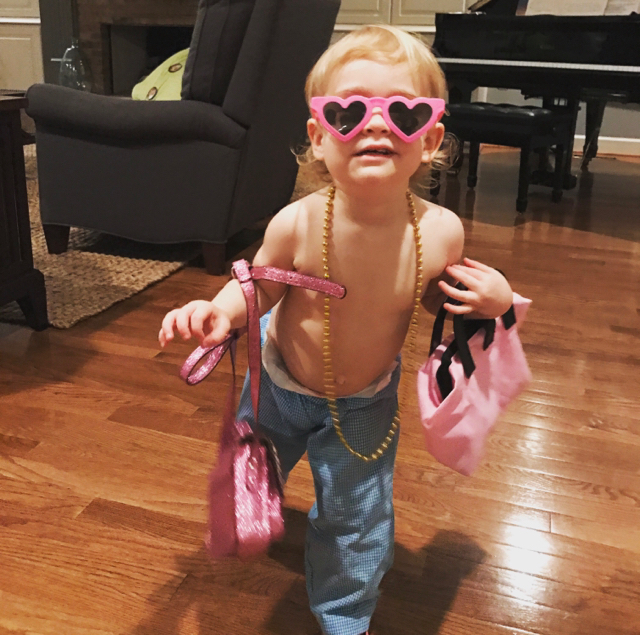 Once she stated sleeping through the night (at 14 months) we really got into the groove! We have been able to go on some wonderful trips together and watch her learn and experience so much through the year! She has grown up so much--it's hard to believe she was just a tiny helpless thing not that long ago! C is speaking in nearly complete sentences. She loves to sing songs although she won't get all the words in there and the tune is usually her own. 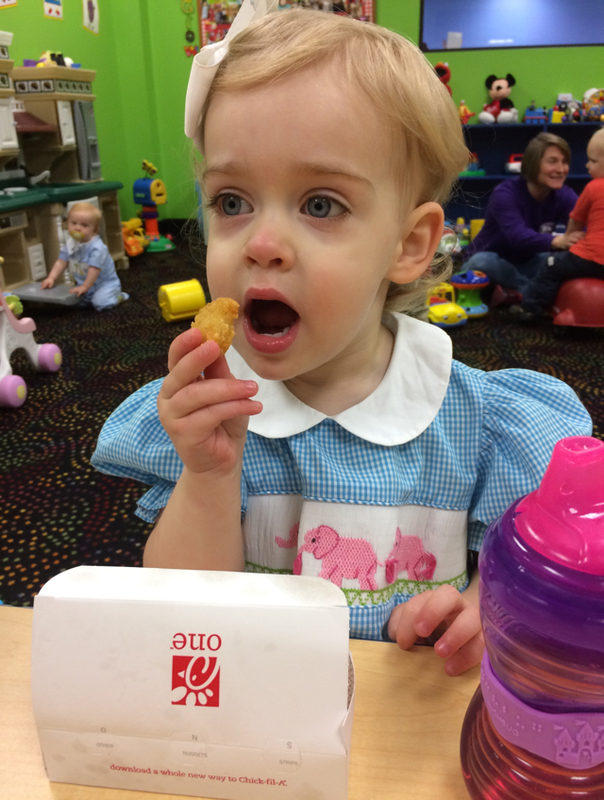 She loves going to her singing sprouts class each week and has just started to recite the Bible verse from class! She sleeps from around 830 to 730 and takes a nap around 130 to around 4. She sleeps with her satin pillow and blanket and her two pacifiers. Lately her stuffed piglet and lambie have been sleeping with her as well. She is still in her crib. 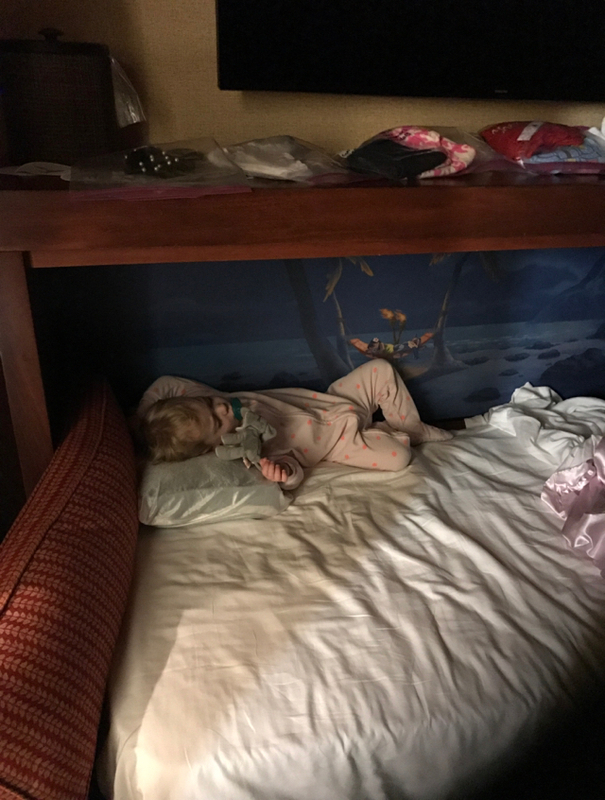 At Disney she slept in a pull out bed near the floor and she did ok, but we are not quite ready to make the transition to toddler bed quite yet. Our girl is a great eater and won't turn down much! She eats 4 main meals (breakfast lunch, dinner and second dinner). She sits in a booster seat for meals although sometimes she would rather sit in my chair. While she eats just about everything she does have to be in the mood--so she might eat a whole banana today but tomorrow she won't take one bite! 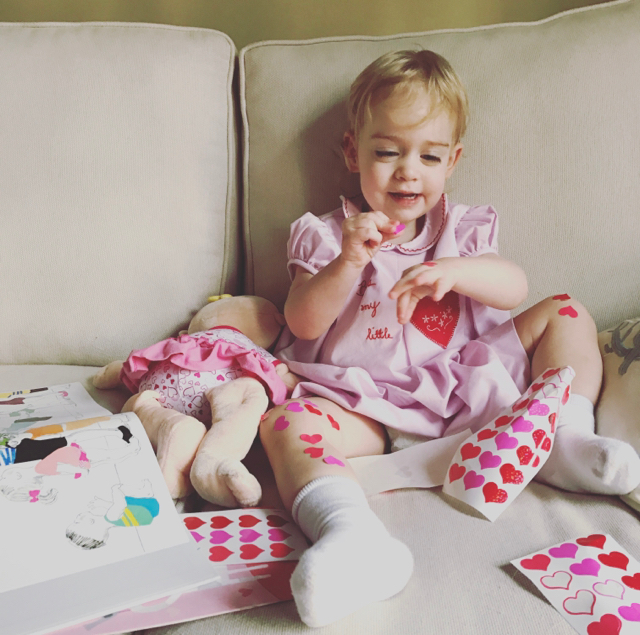 She knows all of her colors and shapes, can count to 10 and knows her upper and lowercase letters. Her she has learned so much at school and amazes me with the things she will know sometimes. 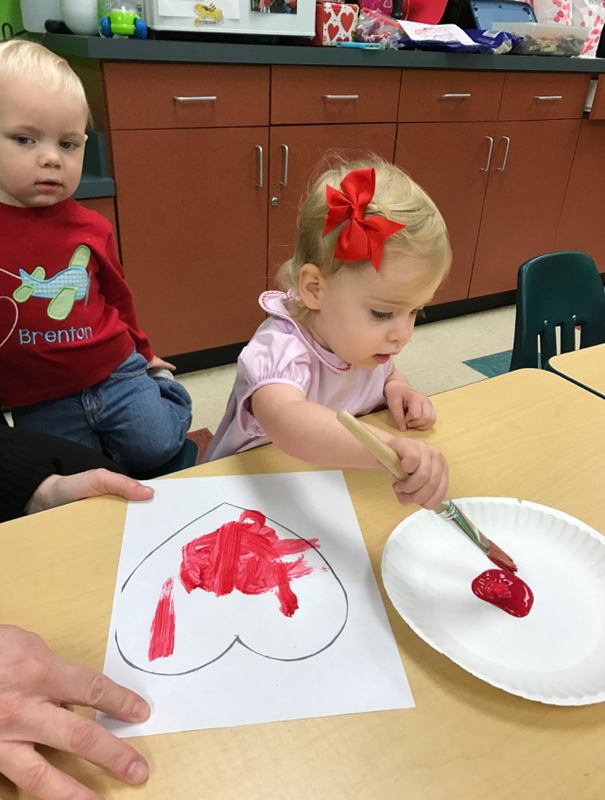 They do an art project at school daily and she loves to show them off to us. She is very particular about her work, so I hope she has a little artistic ability in her (unlike myself). 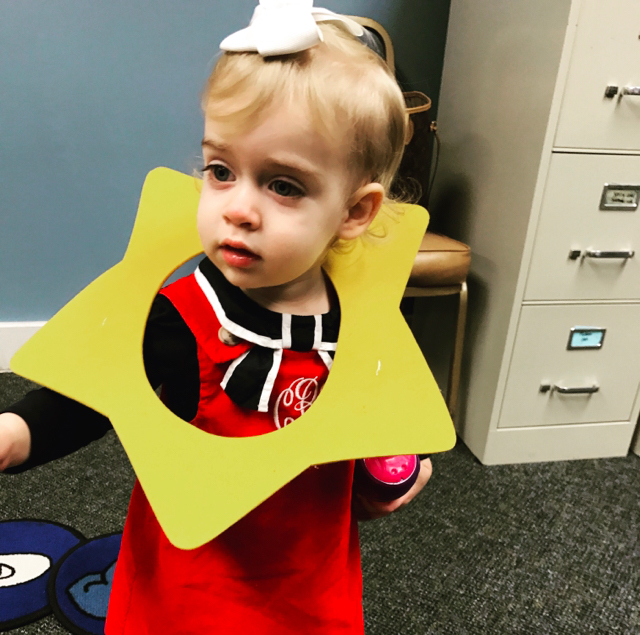 She loves singing and dancing and also enjoys reading and coloring. She just loves to play in general! She is very imaginative and will pretend to cook or care for her babies. She is very brave and will jump off just about anything! She really likes the playground and playing in "tunnels". Stickers are stuck on just about anything that doesn't move too fast (including us and the dogs--the cats are too fast). She will take them all off very methodically by bending the page and she likes to stick them all on top of each other sometimes. The weather has been warm lately she has enjoyed playing outside--she cries when we take her in! We are so looking forward to summer with her and seeing what fun things she gets into. I'm pretty sure it will involve water and bubbles! I am hoping to find her some swim lessons before summer, because this girl had no fear around the water last year so I want her to know how to swim on her own. 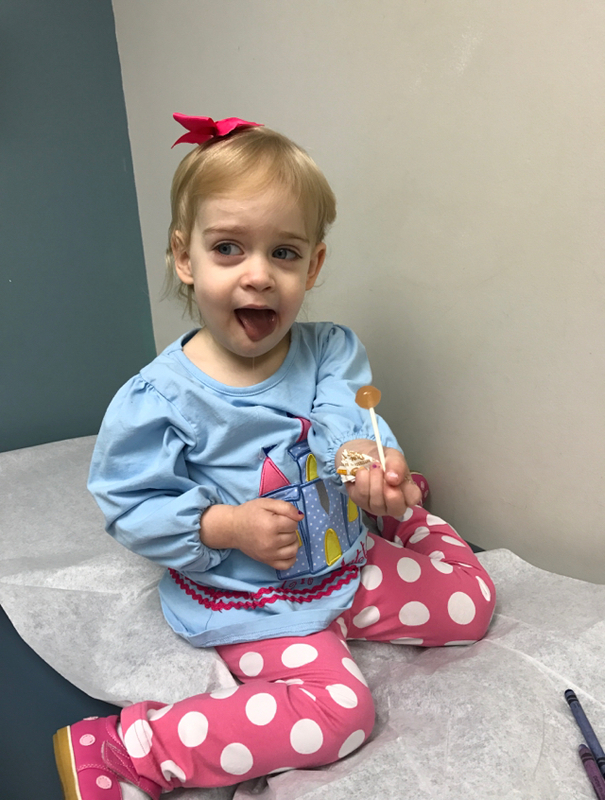 We are looking forward to a fun spring and summer with this busy two year old, and still marveling at how quickly time passes. Where do I even begin??!! As I'm sure you all know (because I was very vocal in my disappointment) we had to cancel our October Disney trip due to a hurricane. 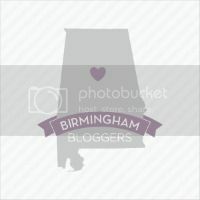 I was so devastated that we decided to reschedule! We just got back and I can honestly say it was the best trip! I had some reservations with taking Charlotte at her age but she did great and loved every single second. 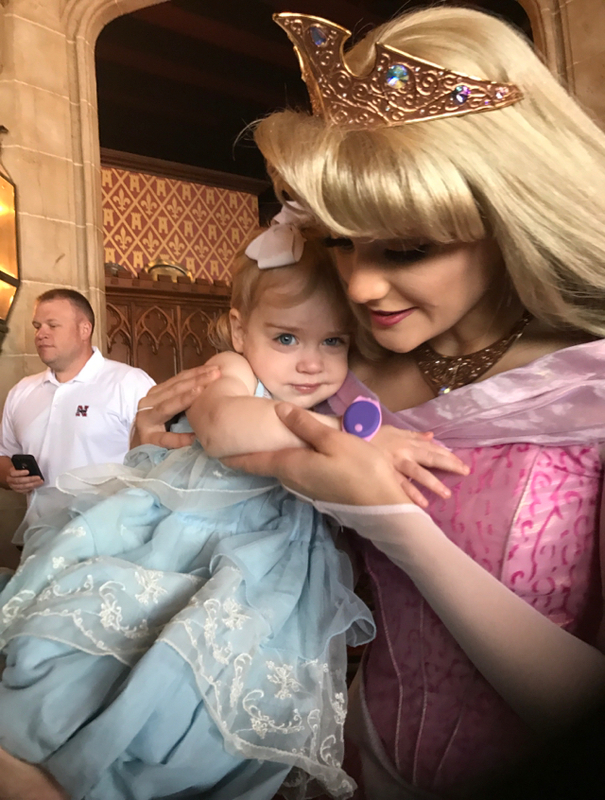 I was not worried about her being afraid of the characters, since she wasn't afraid of the Easter bunny, and always liked seeing big al at the football games, but travel can sometimes be hard with a baby on a schedule. Luckily we worked wishing her routine and she had the time of her life! We left on Wednesday at 12 which was awesome--we didn't have to wake up extra early or rush to leave the house. 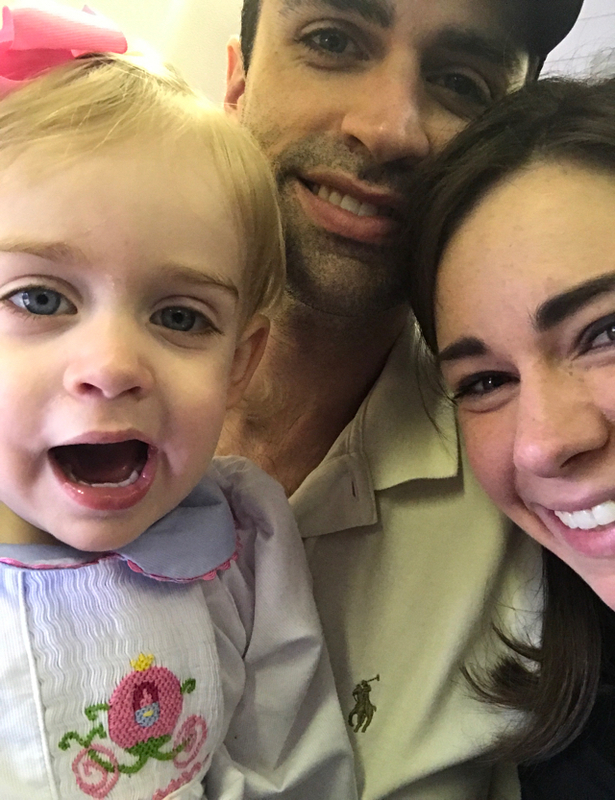 We used our southwest points so our flight was free, and Charlotte is under two so she flew for free as a lap child. She was very excited to get on the airplane! We elected to have a car pick us up at the airport with a car seat rather than wait on the magical express shuttle, since we arrived right at naptime. The shuttle is free but can take a while, so this expedited the process to getting us to the hotel to get her down for a nap. 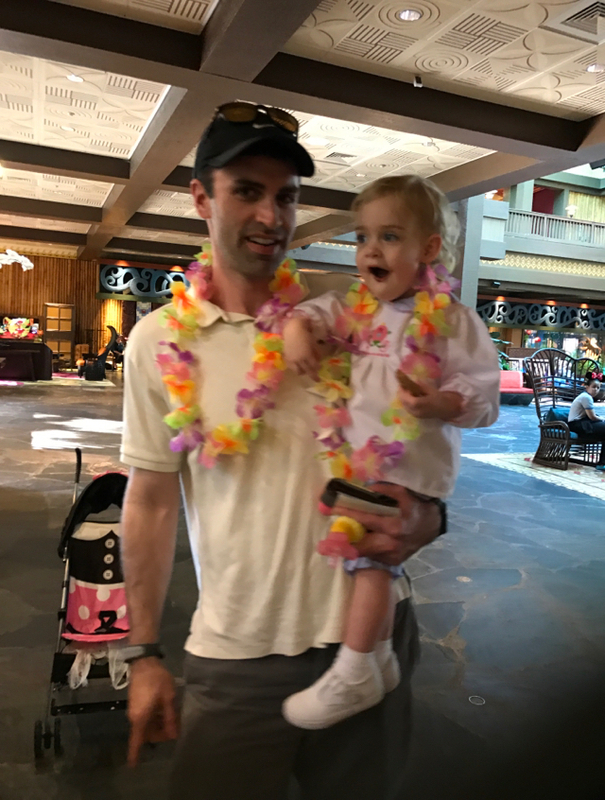 We arrived at the Polynesian and we were very pleased with how cute it was! 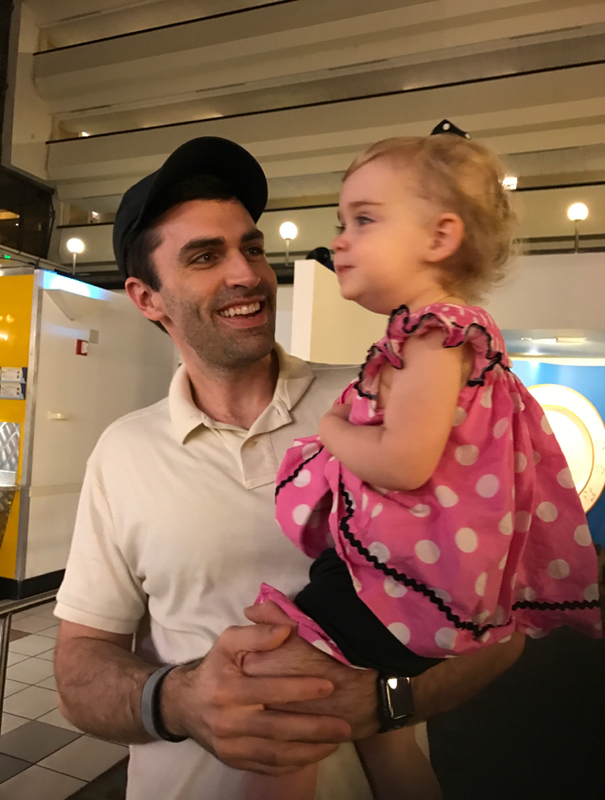 Charlotte loves getting a lei and a chocolate chip cookie at check in. I know I teared up when they told us "welcome home", and pretty much stayed in a teary state the rest of the trip. Notice our Minnie stroller--last minute I decided I didn't want to haul our giant stroller all the way down there and picked up this sweet Minnie stroller at Walmart. Since c doesn't sleep in the stroller it was a great decision for us--it was light and compact yet got us where we needed to go quickly and easily. The Polynesian room was very cute. We got our room by purchasing points left over from Disney vacation club members, so we had a choice room for about 1/3 of the cost! Charlotte's favorite part of the room was the little Murphy bed! 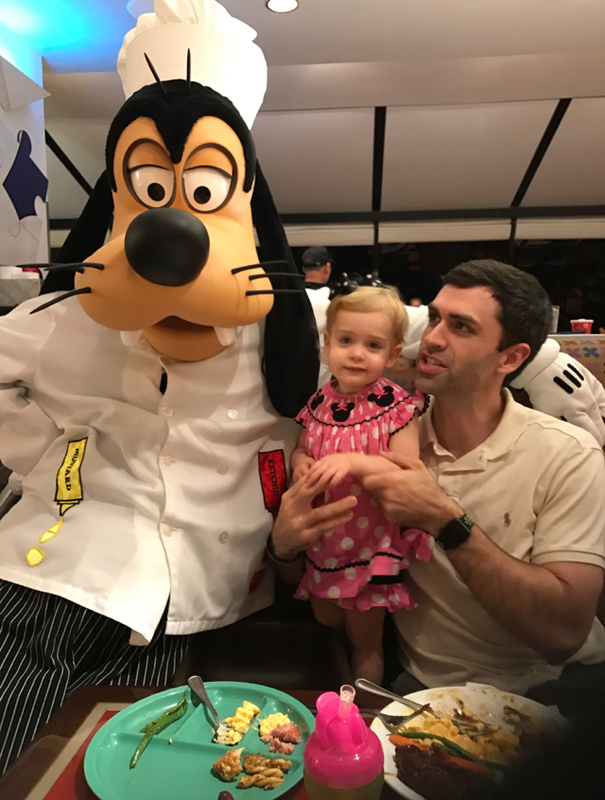 After a nap, we went to chef Mickey! 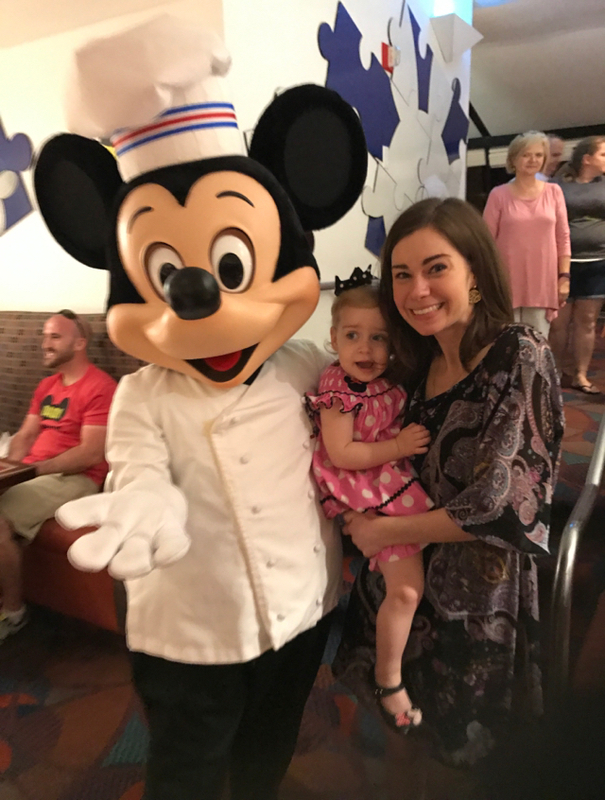 We didn't want to buy a park ticket for less than half a day so we elected to just do a meal at a resort and of course chef Mickey was our top choice! While we waited for our table (just a few minutes as we had a reservation) Charlotte saw donal duck walk through the restaurant. 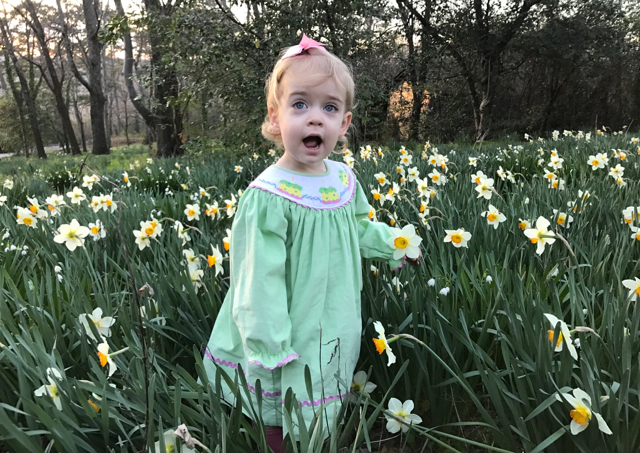 She was amazed! She screamed "DONALD duck mommy" and tried to run to him. It was precious! We thought our meal was quite nice (although looking back the rest of our meals were far superior, although this one was fine). However the characters were the stars of the evening! Charlotte thoroughly enjoyed herself, and so did we. C was a little nervous of Goofy--he was pretty big. She kept telling him to go home! When she saw Mickey she was so excited! She clammed up a little when she got close to him, as she did with many characters. She got star struck! 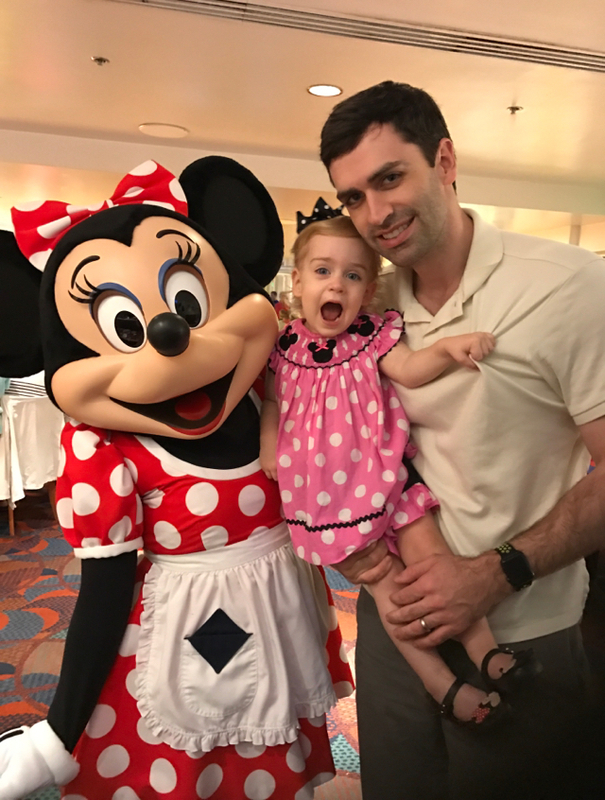 Minnie was her favorite! She called for her as she walked through the restaurant. She was so excited to hug her and show her the Minnie Mouse shoes she was wearing. 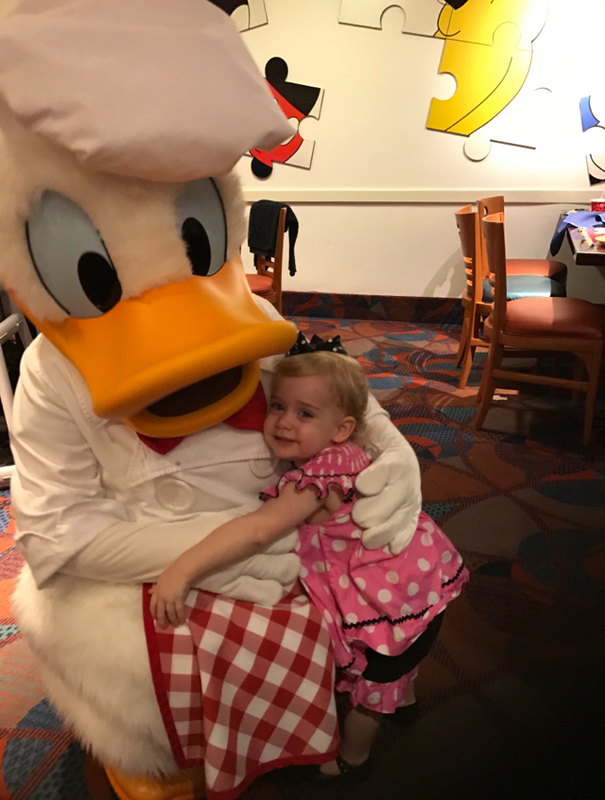 DONALD was a big hit! She got to do a fun dance with him! She was also into Pluto pretty much the whole trip. She got to wag her tail and dance with him--heaven! 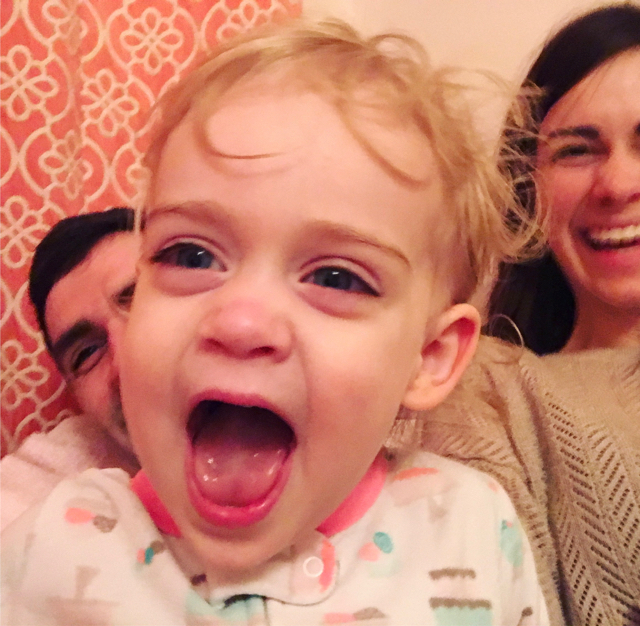 She was so exhausted that night and we had the absolute best time watching her face light up and get excited! I was worried that the trip might be too much for her but it only took one meal to realize that was definitely not the case!